Vodafone Fiji Limited handed over PhysioNet United Kingdom (UK) assistive devices worth over $1.2million to the Spinal Injuries Association (SIA) at the Tamavua Rehabilitation Centre yesterday. Vodafone’s chief financial officer, Divik Deo, said the wheelchairs and various other mobility devices had been possible through a partnership with Vodafone Fiji Foundation’s World of Difference programme with SIA and PhysioNet. “Our association with SIA goes a long way when we first funded them in 2008,” Mr Deo said. In 2012, he said, they identified Joshko Wakaniyasi a worthy candidate and SIA a worthy organisation to benefit from financial grants to champion the rights and needs of disabled persons in the country. Mr Deo said they had also assisted various hospitals and health centres. He said they did not like to use the word disabled because Mr Wakaniyasi had achieved what an able bodied person could not have done. 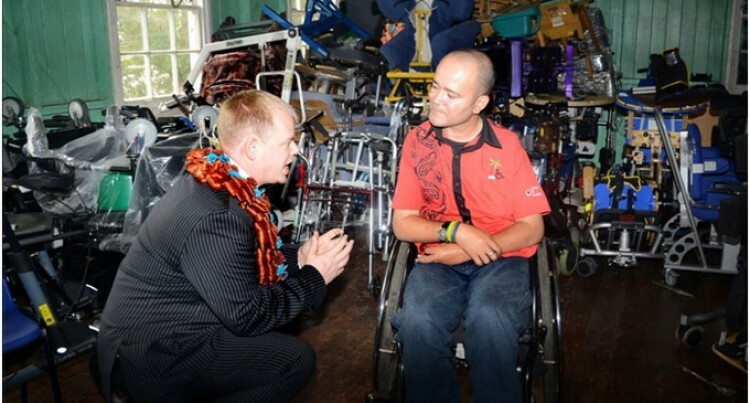 The Deputy High Commissioner of the UK to Fiji, Dan Salter, said they were happy to provide for the needs of disabled persons. “Our efforts are to continuously support organisations that initiate projects and put in every effort to multiply and replicate its effects,” Mr Salter said.